Chuwi Hi10 Air with 4GB RAM, 64GB internal, Intel Cherry Trail Z8350, fingerprint sensor, and 6500mAh battery. 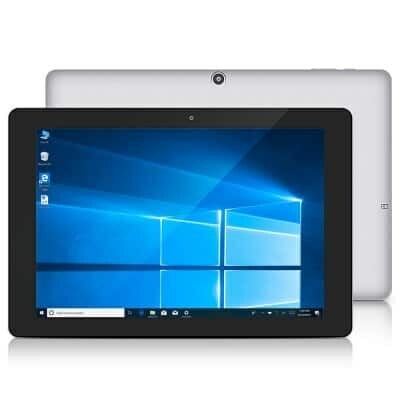 Chuwi Hi10 Air is the latest 2 in 1 notebook from the company which comes with the fingerprint sensor and Intel Cherry Trail X5 Z8350 Quad Core processor. It is available in Gray color option on Gearbest at $166.99. Chuwi Hi10 Air comes with full lamination technology which reduces air refraction between TP and glass significantly making the picture more vividly. The Hi10 Air comes with only 0.7mm density LCD glass, that creates the outstanding visual effect. It features 10.1-inch IPS display with 16:10 aspect ratio and 1920 x 1200 pixels resolutions. The display comes with 178-degree view angle which gives you clear viewing experience for watching videos and internet browsing. According to the company, 2 in1 tablet comes with metal unibody design which went through 64 CNC process. It is extremely thin with 8.5mm of thickness and makes 562g of total weight including the battery. It is powered by Intel Cherry Trail Z8350 CPU which makes connection with up to 1.84GHz frequency and Gen8 HD graphics. For storage, it has 4GB of DDR3L RAM and 64GB eMMC internal storage with reading and writing speed up to 150m/s. Internal storage is expandable up to 64GB with an external MicroSD card. The all-new Chuwi Hi9 Air tablet comes with 2MP rear and 2MP front camera sensor. It runs on the Windows 10 operating system out of the box. It is juiced by 6500mAh battery which can last up to a full-day even in heavy usage. It comes with USB Type C 3.0 charging port which can charge fully in just 3 hours of time.